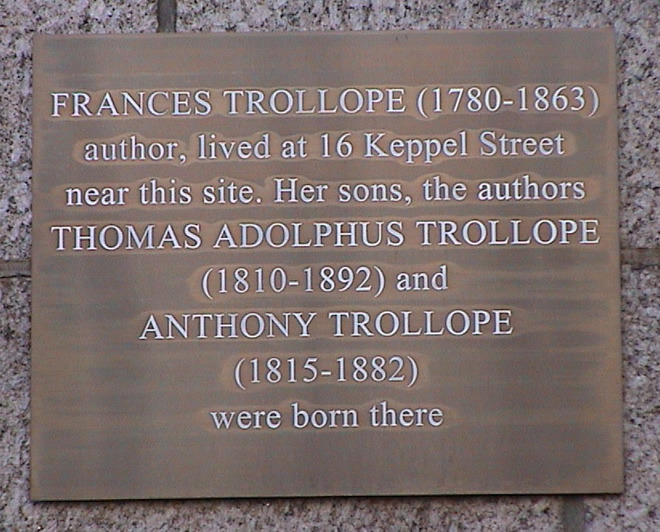 Frances Trollope (1780 - 1863) author, lived at 16 Keppel Street near this site. 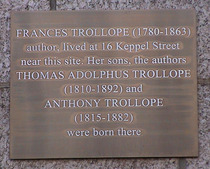 Her sons, the authors Thomas Adolphus Trollope (1810 - 1892) and Anthony Trollope (1815 - 1882) were born there. Unveiled by William Rees-Mogg in June 2000. Frances's date of birth, 1779 (according to the Dictionary of National Biography), appears incorrectly on the plaque as 1780. Author. Mother of Thomas Adolphus and Anthony. Former editor of The Times.